Repairing a stereo microscope can be tricky, especially	if the prisms are giving you a problem! This paper illustrates how careful usage of cyanoacrylate super glue can do the trick. The Morning Show: Looks can be deceiving! The June Beetle (Pelidnota punctata) up close. Microscopic observation requires a safe and stable chair with a good back support. 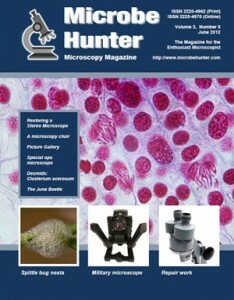 This paper presents the history of the FM 600 military microscope. It provides a look at how one microscope progressed from concept to implementation. Testing the iPad camera on a starfish. Who would have thought that the nests of spittle bugs are the home of ciliates? I really like the magazines.